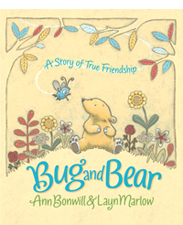 Bug and Bear fall out because they want to do different things. If only Bear could think about how Bug feels! If only Bug could think about how Bear feels! Do you feel buzzy like Bug or sleepy like Bear? 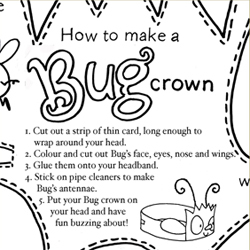 Here you can make a crown to suit your mood, then have fun buzzing or lumbering about. 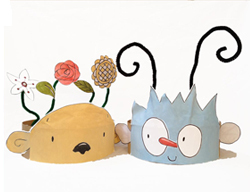 Or you might like to make a Bug crown AND a Bear crown, and see how it feels to wear each of them. 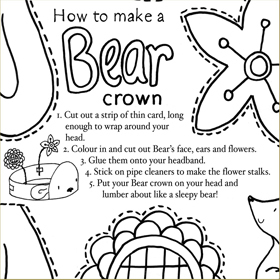 Click on the black and white images to download printable pdfs, including instructions on how to make your crowns. – two pipe cleaners for each crown.